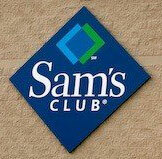 I mentioned on my Facebook page my trip to Sam's Club yesterday. Here are a few things I didn't expect to see. 48 packs of diapers, but 108 packs of adult diapers, I guess they are betting on grandma. 288 feminine napkins, 288 count box of chocolate bars, coincidence, I think not. For $400 I can get one of those signs with the flashing arrow and movie marquee letters. My next Fourth of July party will be easy to find. Prewrapped Christmas gifts -- now your company can buy a box of assorted prewrapped gifts. This says to your employees "I care about you enough to buy you a Christmas gift, but not enough to know what's in it or wrap it myself." 50 pound bags of unpopped popcorn for about $40. So that means the movie theater margin is more than 99%. 50 pound bags of uncooked rice for about $20. I'm opening a combination movie theater/Asian restaurant. Gigantic bags of chicken wings were more than I expected. Now I know why I have to pay six dollars for a Heineken on $.25 wing night. They had an amazing 72 inch TV for only $290. I was going to get one until I realized the stack of boxes next to the television was covering the first digit... $2290. On a more serious note, I got one fantastic deal! I use a label machine in my store. Staples charges $30 per tape. Sam's Club sells them for $30 per three pack. I bought two packs and saved enough money for my annual membership if I never use it again. On the way there I filled up my gas tank. It wasn't empty and cost $102. Gas at Sam's Club was $.40 cheaper per gallon. If I lived closer, it would save me half my membership fee per fill up. I also really like that they don't bag your merchandise. It is inconvenient, but I spent $300 and came home with no extra landfill. Between grocery stores and Wal-Mart, that probably would have been 20+ plastic bags. It won't replace grocery shopping, but it will reduce the waste my family creates. Even using canvas shopping bags, we inevitably end up with several plastic bags each week. Yes, I know you can recycle plastic bags, but let's face it, whether it's now or later, eventually they end up in a landfill for 1000 years. A few things made me chuckle, but overall, I really like this style of shopping.